But Campania’s real secret is located South of Salerno, and immediately south of the wonderful Greek temples of Paestum. 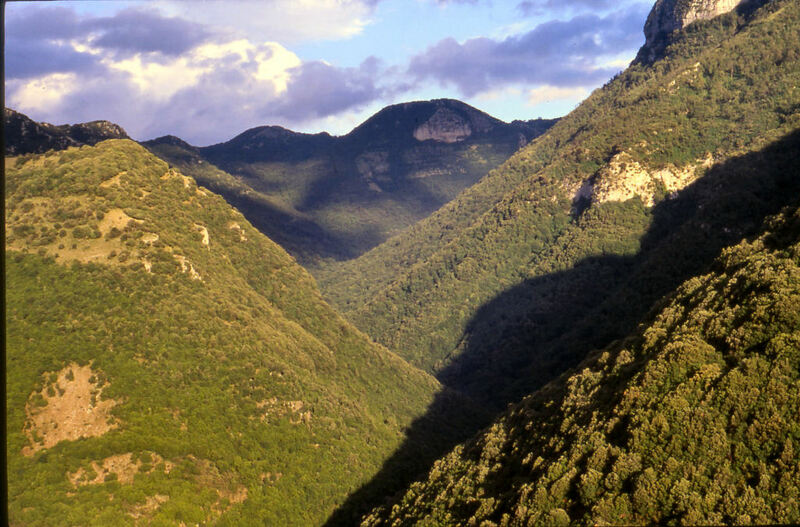 Here the coastline bulges out into an expanse of mountainous landmass known as the Cilento, now one of Italy’s biggest National Parks, with World Heritage listing. 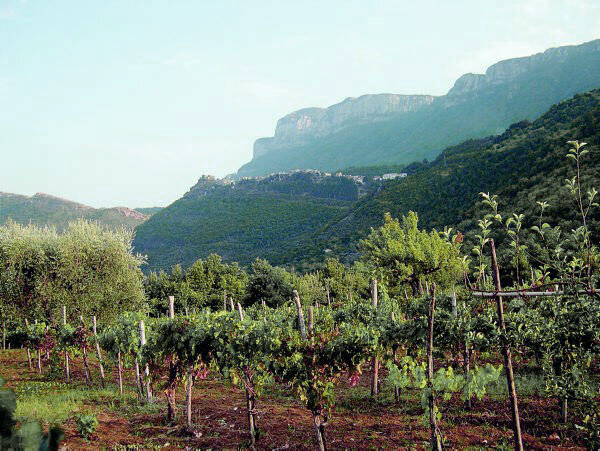 This tour brings you into the real ‘Heart of the Cilento’, along the Calore river and up into the wild Cervati mountain range, and finally onto the impressive Alburni mountains. This area is largely undisturbed by the 21st century and you will encounter few other tourists along your way. 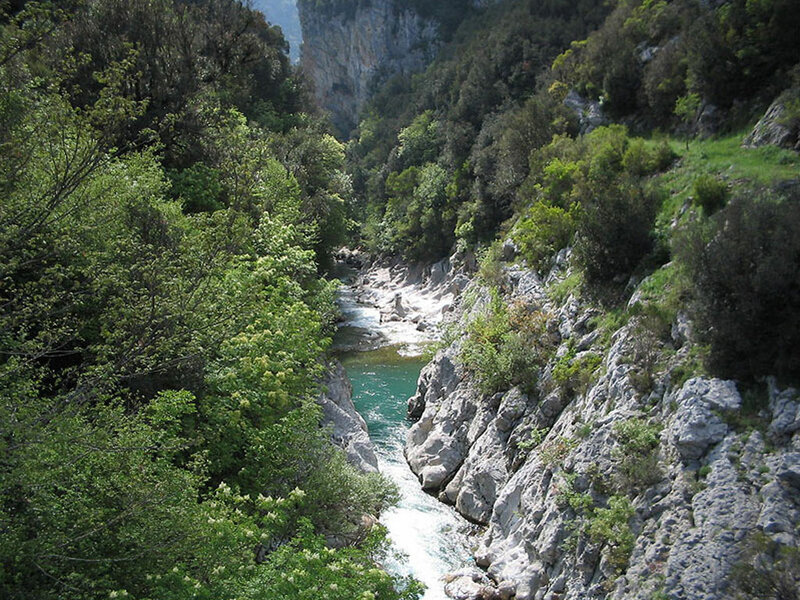 You will walk through pristine natural areas, like beech and oak forests and mountain meadows, beautiful river valleys, impressive canyons and great mountain scenery. 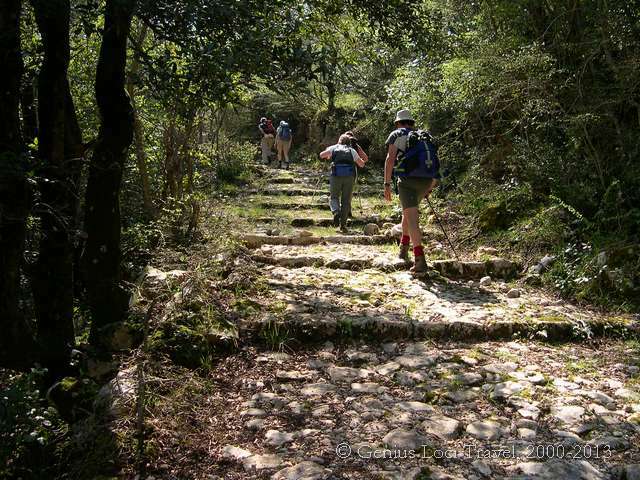 But as well will you walk through attractive countryside, with vineyards and olive groves and all its cultural treasures like rural chapels, ancient farm houses, old water mills and charming medieval villages. 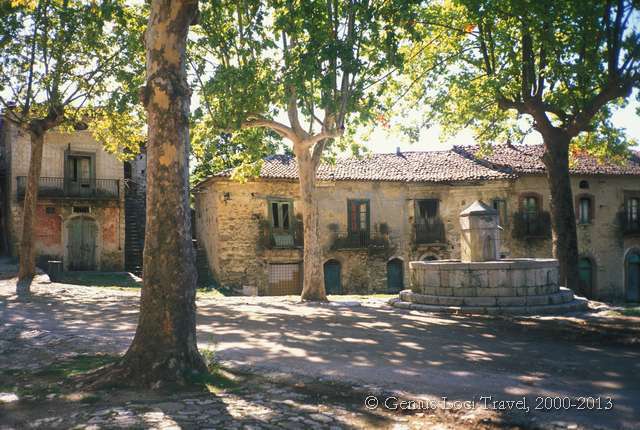 You’ll visit some of the nicest mediaeval villages of the area, where the traditional way of life is still evident. And you’ll enjoy visiting some of the Cilento’s greatest cultural treasures, like the rock churches of Magliano, St. Michael’s cave church in Sant’Angelo a Fasanella, the ruins of Roscigno Vecchia and the castles of Laurino and Sicignano. All linked together by a great walking route. At the beginning or the end of the tour there is also an opportunity to visit Paestum or Pompeii, or spend some time on the beach. The tour can easily be combined with a possible journey along the coast of the Cilento or with a tour on the Amalfi Coast. Average walking times: approx from 4 to 6 hours each day. Arrival by train in Capaccio / Paestum (which can easily be reached from Naples). You can visit the amazing Greek temples, before being transferred to your agriturismo in the green valley of the Calore River near Felitto (transfer service included). Those who come by car can leave their car here (a transfer service from the last accommodation back to here can be arranged). Today you make a circular walk, a good introduction of what the area has to offer: ranging from wild nature to hidden cultural treasures. 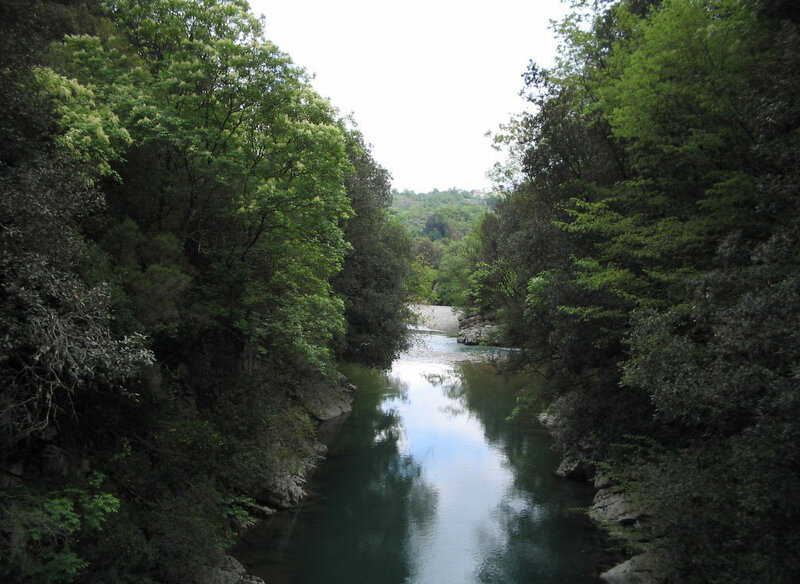 First you walk (or be brought by car) to Felitto, towering high above the green canyon of the river Calore, one of the highlights of the Cilento National Park. An old path leads down to the river from here. 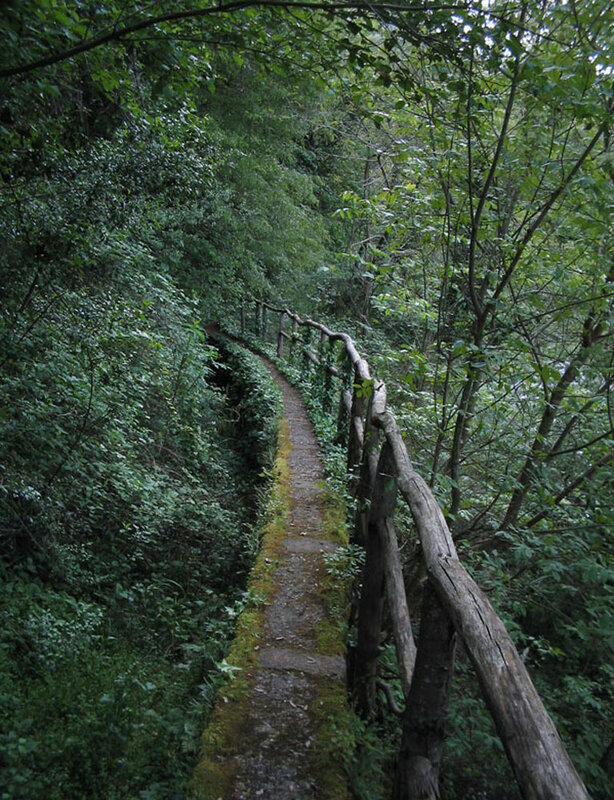 First you walk along a beautiful path along the old aqueduct to a picnic area at a small artificial lake, and then you take a path which penetrates into the wildest part of the canyon, first through the maquis, then through the forest, into one of the most unspoilt areas of the Cilento National Park. The path has several amazing viewpoints overlooking the canyon. You come along caves (in one of which a hermit used to live) and the ruins of watermills. 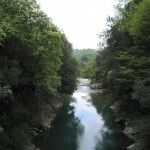 Vegetation is abundant and in the crystal clear water there are still otters and trout. Along the route there are several nice swimming spots. 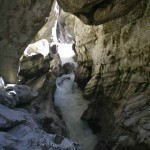 Then you arrive at a natural bridge over the river, which you cross (it is possible to descend into the canyon here, all the way down to the river bed). From the bridge the path continues along the river, and then, underneath the towering coloured rocks you arrive at another symbol of the national park: the famous medieval bridge, one of the best preserved in the area, at the very scenic other entrance of the canyon. From here through forest and pretty countryside you walk back to the little artificial lake of Remolino (and perhaps go for a swim) and then to Felitto. From here you can either be picked up, or choose to walk back the last stretch to your agriturismo. Distance: 12 km. Approx. 4- 5 h. walking. Ascents and descents: ca. 300 m.
You start the day with a short ride from Felitto to Laurino today. Already from far away you see this town towering high above the river. 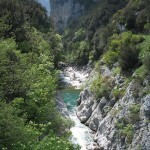 Just below the town, you start your walk, following the canyon underneath Laurino. 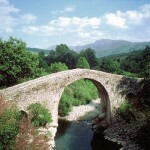 After about 30 minutes walking, you arrive at a small medieval bridge which leads to the little church of Sant’Elena. From here a good mule track leads into the ‘real’ mountains, following the spectacular green Soprana valley. 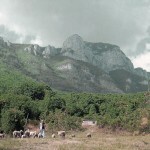 Through thick forests, you arrive at a beautiful mountain meadow, with some extensive grazing and ruins of houses. 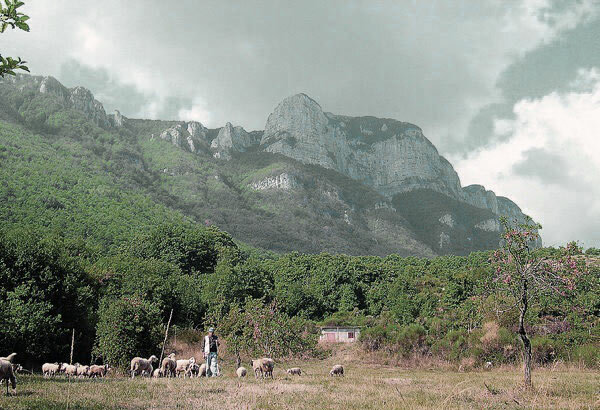 Shortly further on, you can discover one of the most interesting karst phenomena of the area: a whole river disappearing into the ground. 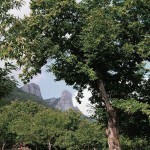 The way back – again along ancient mule tracks – takes you along some of the most amazing viewpoints of the area. An optional visit brings you to the cave of St. Michael, with a statue of the Archangel. From here it’s an easy way down to the pretty little village of Valle dell’Angelo, where you sleep in a ‘locanda’, just above the village square. In the evening you eat in a renowned ‘Slow Food’ restaurant. Distance: 15 km. Approx. 5-6 h. walking. Ascents and descents: ca. 500 m.
Today you can first take some time to wander along the narrow medieval streets and drink a coffee in the town square, before walking off to close by Piaggine, the next village. 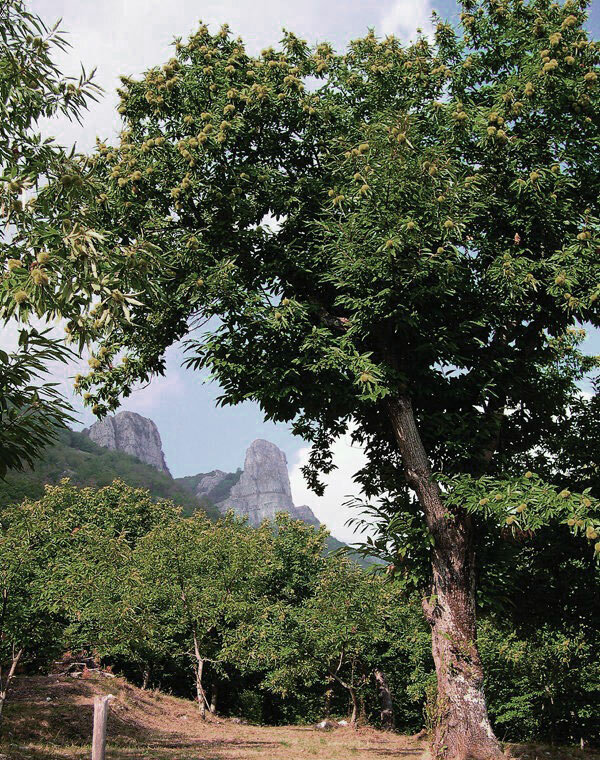 From here you start the real walk, up into the mountain valleys underneath the sanctuary of Monte Vivo. You walk along dramatic canyons and past medieval bridges, before starting the climb along the old pilgrim’s path towards the little chapel. From the sanctuary you will have beautiful views over the whole area. 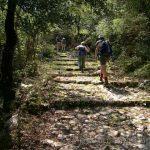 The real walkers can continue to the summit of the Monte Vivo, before descending again to Piaggine along quiet little roads. Now take some time to look around in Piaggine, before you walk back to Valle dell’Angelo, where you spend one more night. Distance: 12 km. Approx. 5 h. walking. Ascents and descents: ca. 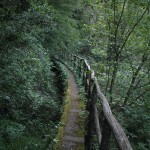 400 m.
From Valle dell’Angelo you first walk to the nice village of Piaggine. 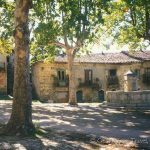 After a coffee in the town square, you descend into a pretty green valley, with maquis, olive groves and orchards, a timeless rural landscape. 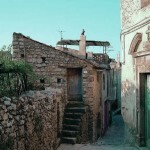 An age-old footpath brings us to the pretty little town of Sacco, a village where time really stood still. The cathedral has to be visited! 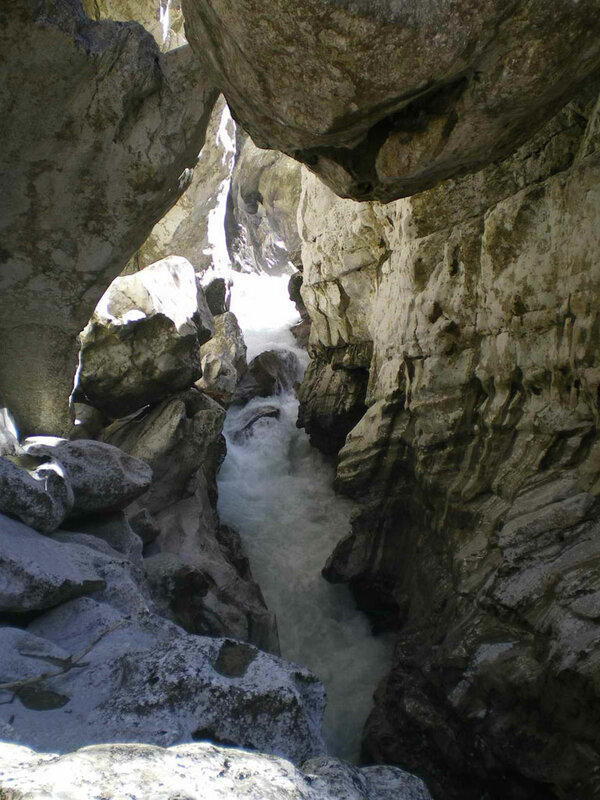 Along a medieval mule track you then descend to the ‘sources’ of the Sammaro river, which here comes to the surface in a stunning canyon, after having run underground for several kilometres. An ideal spot for a picnic lunch! The path then continues at the other side of the river and brings you to the ‘ghost town’ Roscigno Vecchia, also called the ‘Pompeii of the 19th century’. 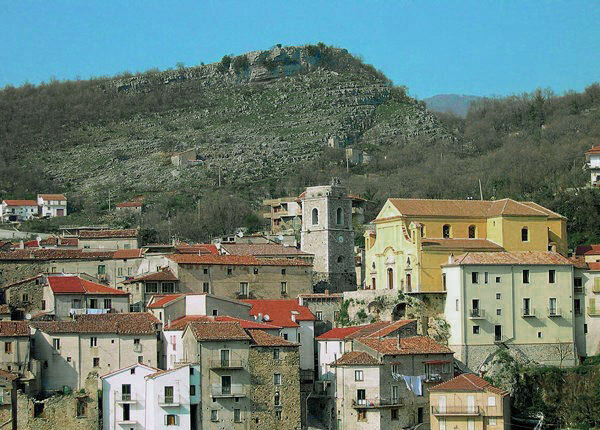 This little village, abandoned at the beginning of the 20th century, has remained unchanged since then. A beautiful setting, especially at sunset! From Roscigno Vecchia, according to where you sleep tonight, you then either walk up to the ‘new’ Roscigno, to a nice B&B, or you walk on to a beautiful agriturismo in the countryside of Bellosguardo. Distance: 14 km. Approx. 5 h. walking. Ascents and descents: ca. 400 m.
Directly from your country inn, you continue your walk. From Roscigno you climb up to the Monte Pruno, an archaeological site, where you can admire the impressive stone walls from the 4th century BC a, number of tombs, as well as beautiful viewpoint over the whole area. 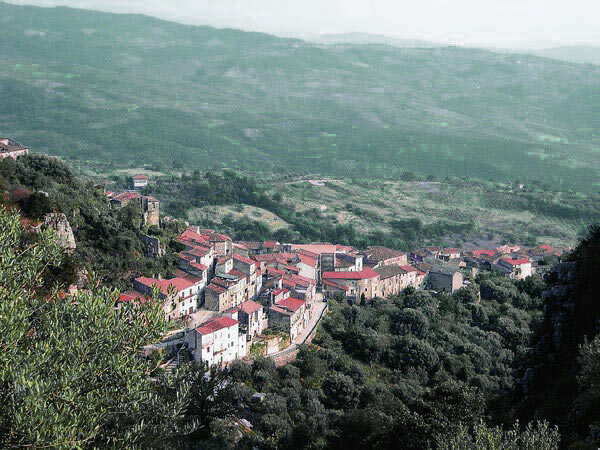 From here you descend to the quaint little village of Corleto Monforte, as the name already says, a fortified mountain, with a pretty medieval town centre built on the promontory, overlooking the valley. 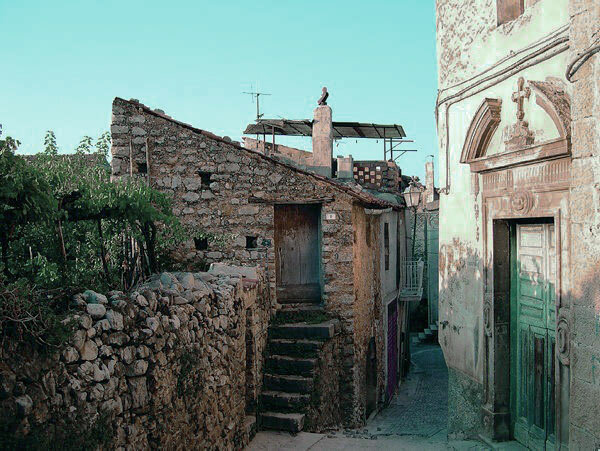 Along a beautiful ancient mule track, along old watermills and through the olive groves, you then walk to Sant’Angelo a Fasanella, one of the most interesting little towns in the area. 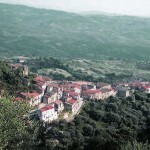 Here you have the time for a drink in the square and then walk the last 500 m. to your beautifully located agriturismo. You’ll enjoy dinner in the nice restaurant overlooking the whole valley. Distance: 8-10 km. Approx. 4- 5 h. walking. Ascents and descents: ca. 350 m.
Today you make a beautiful roundwalk. First you walk to the town centre of Sant’Angelo, and now take the time to visit the impressive church in the cave of St. Michael, certainly one of the most beautiful churches you’ve ever seen! 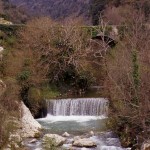 Then you’ll walk down through the medieval streets to the river Fasanella. 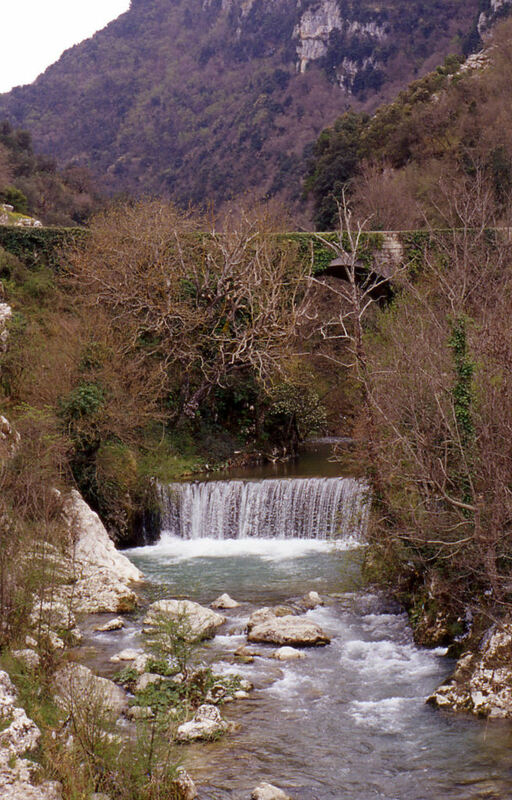 You then follow the river valley, along a medieval mule track, with remaining bits of the old Roman road, and shortly reach one of the most picturesque sites of the National Park: the so-called Risorgenza dell’Auso, where the river Auso comes to the light, after having run underground for several kilometres. 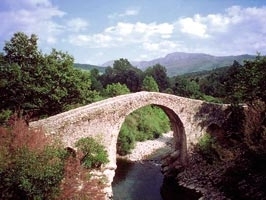 The ruins of the medieval watermills and the bridge make the picture complete. From here you walk up to the church of Cardoneto and then along the ancient staircases to the nice little village of Ottati. Then you can choose to either walk or take the local bus back to Sant’Angelo. Or opt for an extra walk through the mountains. You’ll enjoy another night and another dinner in your beautiful agriturismo. 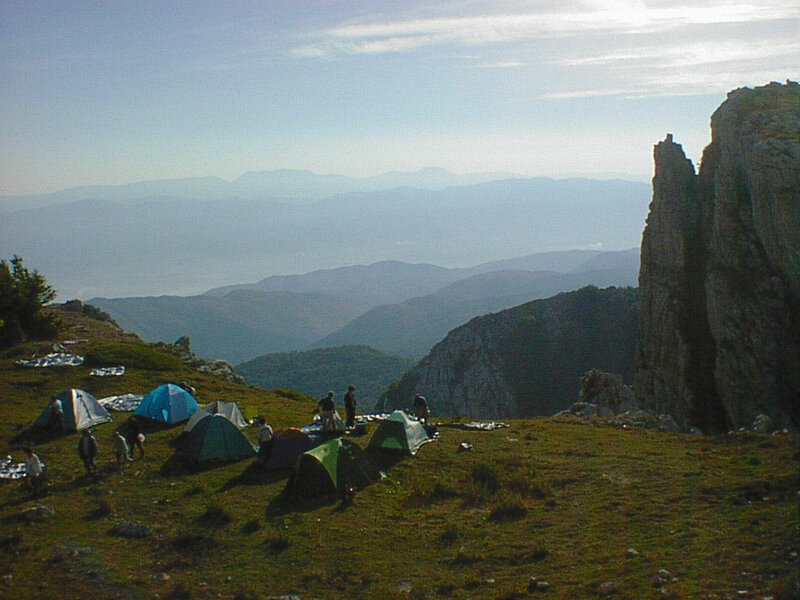 A short transfer brings you to the high plain of the Alburni Mountains, a wild calcareous mountain chain with many caves, huge beech forests and bare rocks, an area where wolves still wander around. You are brought to the beginning of the path which leads to the so-called ‘Antece’, a prehistoric stone warrior, sculpted in the bare rock. From here you walk along easy mule tracks through the high plains, along several sink holes. You reach the edge of the mountain plateau at one of the most impressive viewpoints of the area: ‘Il Figliolo’, a sheer drop of several hundreds of meters and a marvellous site to overlook the plain of Salerno, the sea and the mountains. 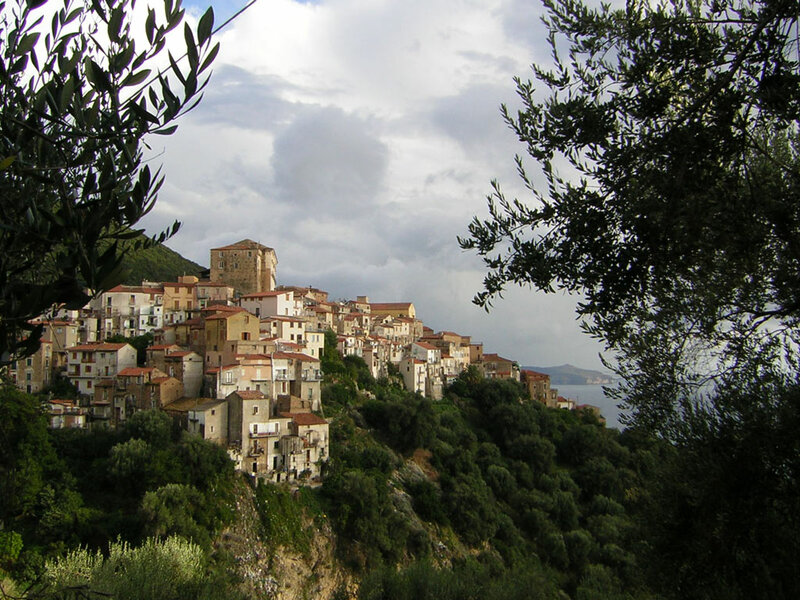 Then through the beautiful beech forest, along ancient mule tracks you walk down to Petina, a nice little village, where you have time to wander through the old streets of the village centre, before transferring to Sicignano, where you stay in a nice agriturismo (transfer included). Distance: 16 km. Approx. 5 h. walking. Ascents: ca. 250 m. Descents: ca. 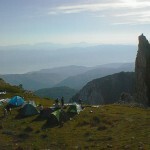 850 m.
On this last walking day you will visit the north side of the Alburni Mountains. 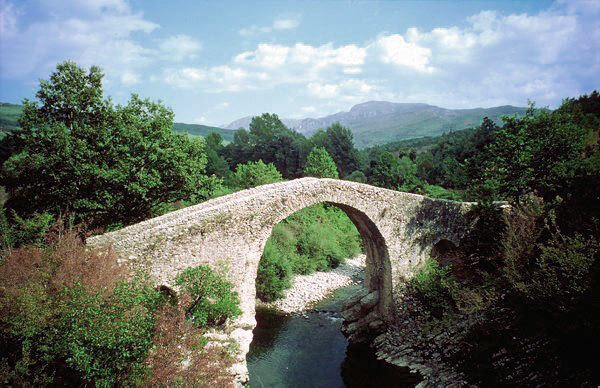 You walk through thick forests and nice countryside and wander through medieval villages. 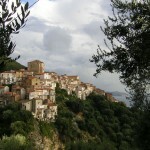 In Sicignano you walk up to the ruins of the castle, an impressive viewpoint. One of the other villages has been completely abandoned, and now is a ghost town with dramatic views over the plain. For those who want there is the possibility to walk up into the ‘real’ mountains, with various (strenuous) walks to be done. Several possible options: 2 – 8 hours walking. Ascents and descents: from 200 – 600 m.
Unless you have booked an extension, the tour finishes after breakfast. You are brought to the train or bus station (transfer included), for you return to Salerno, Naples (airport) or Rome. An extra night in any hotel can be booked upon request, as well as an extra night in Naples, Salerno and/or the Cilento/Amalfi Coast. All nights are spent in beautiful, welcoming farm houses (‘agriturismo’), or in so-called ‘locanda’ (the French ‘Auberge’, or British ‘Inn’), all small characteristic family-run accommodations. All rooms have en-suite facilities. Accommodation is on half board basis, in all accommodations. So all evening meals are included; either on the premises of the hotel or ‘agriturismo’ or in a nearby restaurant. Nights 1 & 2: The first nights are spent in Felitto in a very good ‘agriturismo’, just outside the medieval village, in a beautiful green valley. 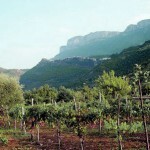 Food is known to be very good and the farm produces its own full-bodied red wine. Night 3 : The next accommodation is a newly opened, completely restored ‘guesthouse’ right in the village square, overlooking the mountains. Dinner will be in a renowned ‘Slow Food’ restaurant, on the same square. Night 4 : Tonight is either spent in a recently opened guesthouse, right in the old centre of Roscigno, with dinner at a close by restaurant. In alternative you can stay in a comfortable agriturismo, where dinner is served on the spot. Night 5 & 6: These nights are spent in a comfortable ‘agriturismo’, beautifully located, just outside the little town of Sant’Angelo a Fasanella, at the south side of the Alburni Mountains, a recently restored beautiful farm house with swimming pool and good restaurant. Night 7 & 8: The last nights are again spent in a nice ‘agriturismo’, just outside the little town of Sicignano, underneath the towering Alburni Mountains. Moderately easy (level 2-3):Mostly moderately easy walks, but with nonetheless some walking uphill, sometimes on paths with rough surfaces. Orientation can be difficult on occasions (but check out our route notes!). On some days extensions or shortcuts are possible. Fitness: High standard of fitness is not necessary but you should be able to walk for up to 5-6 hours, sometimes also on a day in hot sun on dusty or stony tracks. Waymarking:Only a small part of the route is waymarked (partly by us); elsewhere it is necessary to follow the route descriptions provided together with the maps. With these it is always possible to find your route. In case you don’t feel confident a local guide can be provided for some trails. Arrival: The tour starts in FELITTO; a pick-up service (included) has been arranged from Capaccio train station, which is easily reached from Naples, the nearest city with an international airport. The train ride takes about an hour. 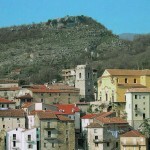 Another possibility is to arrange a pick-up service (included) from Roccadaspide, a nice little town with beautiful medieval castle, connected with Capaccio train station by a frequent bus service. Departure: The tour ends after breakfast on day 9 in Sicignano. A short transfer brings you to the train station (included), from where you travel to your next destination (Naples, Salerno or Rome can all be easily reached). Several taxi services are available to bring you directly to your next destination. It is possible to include extra nights in any of the accommodations en route. At the beginning or the end of the tour there is also an opportunity to visit Paestum or Pompei, or spend some time on the beach. The tour can easily be combined with a possible journey along the coast of the Cilento or with a tour on the Amalfi Coast. As well is it possible to extend your tour with a few days along the Amalfi Coast in Salerno or Naples (with the isle of Capri). Many good accommodations are available. Details & prices on request. 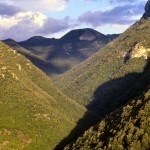 A longer, 11-day version of this tour is also available: The heart of the Cilento National Park (11 days). Bespoke, shorter or longer tours, suiting your agenda can be organised. Please contact us. On request we can also organise a ‘continuous walking route’, with a change in accommodation every day.